Retroactive post! I totally forgot to put this up at the time. 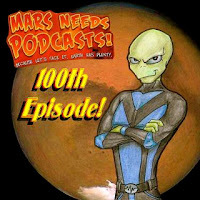 Mars Needs Podcasts reached it's 100th and I was lucky enough to be called in to participate. Not only myself but also Mars Needs stalwart Jason Wood and my old Cabin Fever cohort Brian Fitzpatrick! It's a plethora of podcasters. Click the big alien to listen.